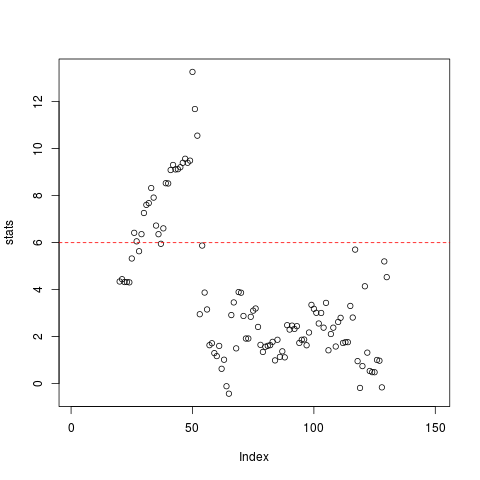 Is there a way to use strucchange package in R on ARIMA models? I haven't been able to find any. Thanks a lot. The package strucchange requires as input the formula of a linear model to be passed to lm. I don't think there is a straightforward way to use the package with function arima. I don't know either any other R packages implementing this but I can give some basic guidelines that may be helpful for your purposes. You can carry out some diagnostics based on the cumulative sum of squared residuals (CUMSUM) and based on F-tests for the parameters of the model in different subsamples. 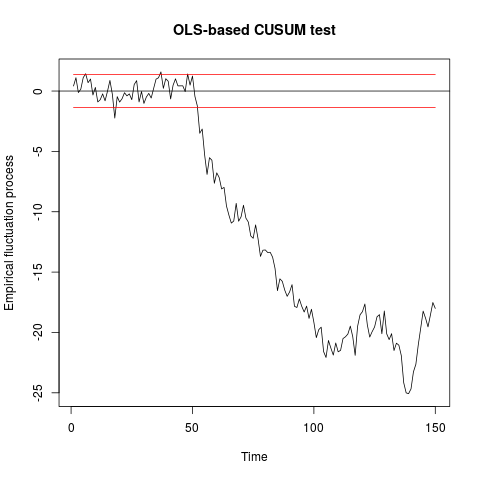 retval$type.name <- "OLS-based CUSUM test"
The confidence limits are just for reference, I'm not sure they are the right values to carry out a formal test in this context. Regardless of this, a sudden change or shift in the sequence cs can be interpreted as a sign that something is going on around that time point, possibly a structural change. In the plot we observe that at around observation 50, where we introduced a change in the data generating process. Similarly to the CUMSUM plot, a plot of the F-statistics may reveal the presence of a structural change. A 95% confidence limit can be obtained based on the chi-square distribution. You may find further details in the vignette of the strucchange package that you probably already know and in the references therein. The time series data used in my blog happens to be an ARIMA(0,1,1) process. If you want to verify that, check my Github repo regarding the same. Not the answer you're looking for? Browse other questions tagged r time-series arima arma structural-change or ask your own question.